A Change of Pace – Dot Com Burger Day! Round ONE – Wally’s DELUXE Wagon Burger! Although it’s true that the Dot Com Crew has gotten together before to enjoy one of the most expensive burgers in Vancouver, it wasn’t on a Saturday, making it an unofficial Dot Com Gathering. This past Saturday, we decided to honour the passing of a Vancouver Burger Legend: Wally’s Burgers. In attendance today was John Chow, Ed Lau, Leo Chiang, Michael Kwan (+1), Greg Morgan and Danny Chang. 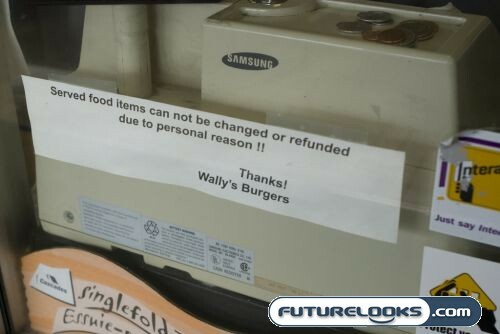 Wally’s Burgers, located on Kingsway in Vancouver, British Columbia is calling it quits. After being a fixture in Vancouver for over 50 years, it’s time to say goodbye. With the rents going up, and the competition getting tough, it’s probably best to go out on a high note as the closure has lit the business on fire with local news coverage, bloggers blogging about it, and a crew of Dot Com Foodies knocking on the front door. 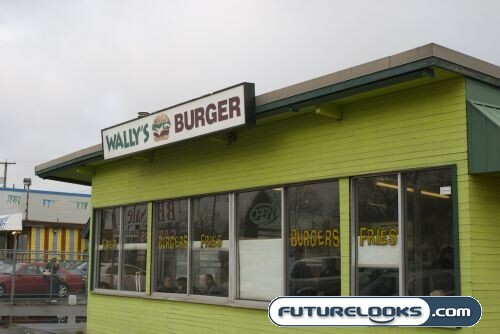 I’ve been to Wally’s before, and if it wasn’t for the fact that it was decided to have a Dot Com Burger Day, I probably wouldn’t have returned. Wally’s Signature Burger is the Deluxe Wagon Burger. 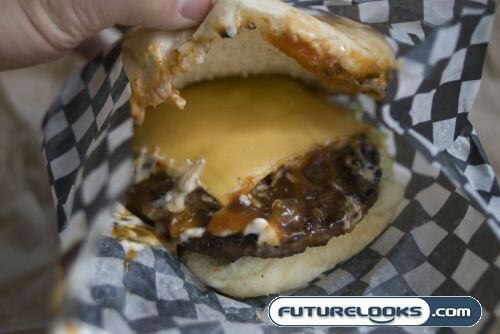 The burger is made of two patties, two slices of cheese, special Wally sauces, lettuce and tomato, all stuffed into a special “Wagon Bun” which looks like a fat hot dot bun. Popular options on this burger including the addition of an egg and a hot dog weiner. At a $4.09 base price plus the options, the burger is fairly plain, using standard “COSTCO” ingredients. It’s definitely no FEENIE burger and it definitely doesn’t hold a candle to the HULK BURGER, however, the lure of nostalgia proves to be too much for most people to ignore. However, price wise, the cost of entry is definitley lower than both the Feenie and the Hulk. 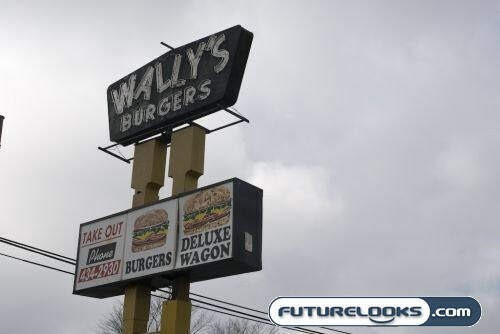 So with this post, I say goodbye to Wally’s Burgers and the signature Deluxe Wagon Burger. May you rest in peace in Burger Heaven. However, this wouldn’t be Dot Com Burger Day without a stroll across the street to their competitors at TOPS Restaurant, home of the SUPER BURGER! Round TWO – TOPS Super Burger! I’m serious. It’s literally, located across the street, so I left my car in the Wally’s lot and walked across the street to meet the rest of the Dot Com Crew at TOPS restaurant. 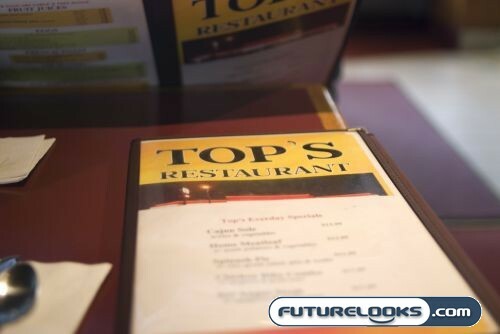 TOPS is a well known eatery for the late night clubbing crowd as it’s open 24 hours a day. However, one of its best kept secrets are their burgers. The TOPS Super Burger gives the aforemention HULK BURGER a run for its money. 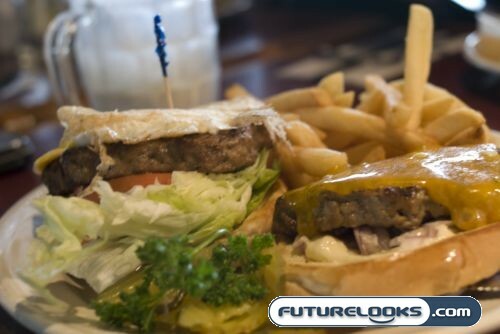 The burger is made of two REAL SIRLOIN patties, and topped with onions, cheese, lettuce and tomatos. It also includes a healthy side of french fries, or your choice of soup or salad. Some of the Dot Com Crew thought that the Wally Burger was better, but I think that a full stomach clouded their judgement. The TOPS Super Burger stomps all over the poor Deluxe Wagon. Although you could argue that for the price of the SUPER Burger, you could have two Deluxe Wagon Burgers with all the fixings, I have to fire back that you would need two Deluxe Wagons just to make you half as full as the TOPS Super Burger. Not to mention, Wally’s frys are extra and the patties they used definitely weren’t sirloin. 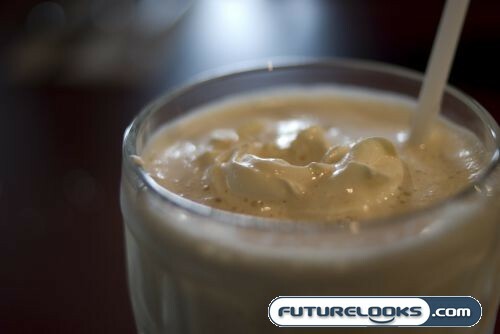 Our TOPS Super Burgers were “topped off” with the addition of one of TOPS signature Cappcucino Milkshakes finished off with a dab of real whipped cream. Most of the other Dot Com Crew were moaning in pain halfway through the Super Burgers, but for some reason, I was having a good day and not only finished off the burger, but I made short work of the fries and the milkshake. We had a lot of Doggy Bags taken home this day as I proved to be somewhat of an enigma. In fact, three hours later, I had to head out and have an Epic Imperial Chinese Meal. I have no clue how I made it to Sunday. For more pictures from our Dot Com Burger Day and Wally’s Burger Farewell, check out my Dot Com Burger Day Photo Gallery. Did Your Parents Make You Take Piano Lessons? The Lab With Leo – CANCELLED!